The A6079 running north from the main A69 at Hexham meets the line of Hadrian's Wall at Low Brunton, a little east of the site of Chesters Fort and close to Brunton House. If you are heading north there's a layby on the right a little short of the crossroads with the B6318, and a nearby stile gives access to a field which climbs gently towards a wooded summit. What you find here is a stretch of Hadrian's wall some 69m long leading away from you up the side of the hill, dividing the field to its south from a wooded drop to its north. The wall is particularly well preserved on the southern side, and much of it rises to a height of 2 metres or more. Set within it is Brunton Turret, also known as Turret 26b, and it is here that the wall reaches its maximum height of 2.8m, with some eleven visible courses when seen from the inside of the turret. As you walk up towards the near end of the remaining piece of wall, progress towards the wooden fence which delineates its area is barred for anyone not wearing boots by the outflow of a spring, which bubbles up in the field a little to the south of the wall. Because of this we found ourselves proceeding past the spring to the dry ground beyond, and then up the southern face of the wall to the turret, an approach that allows you to appreciate to the full the most easterly piece of wall surviving to such a significant height. 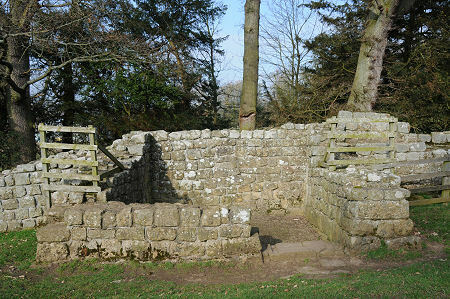 The turret is a small, stone, square shaped enclosure, which you step down into over a stone doorstep which has carved indents apparently intended to take a substantial door. As originally constructed, the turret would probably have been two storeys high. Lookouts posted here might have carried out their duties from the upper floor through windows, beneath a tiled sloping roof: though an alternative theory is that the roof would have been flat and surrounded by a crenellated wall. The second arrangement would have given a better all round view, at the price of a much colder and more miserable location in winter. Back inside the turret a freestanding altar occupies one corner, and we were struck by one of the wall stones, which gives the strong impression of carrying some sort of heraldic carving, with a shield shape surmounting an animal's head. Or it could just be two millennia of weathering. The "wing wall" on the east, uphill, side of the turret was built to the originally planned "broad wall" standard, suggesting the turret was built before the wall itself. It is easy to imagine that the shape of the upper courses of stones here represents a wall surmounted by a walkway. This can't actually be the case, as if the wall had been topped off by a walkway it would be a good few feet above the level we see today. And, in any case, there seems every chance that the lengths of curtain wall running between the turrets was simply a wall and did not carry a walkway or defensive crenellations: despite that being the mental image we all have of Hadrian's Wall. That seems, at least, to be a possible interpretation of a bronze cup unearthed in the West Midlands in 2003. This appears to have been made as a souvenir of the Wall (which it calls the "Aelian Wall"), and seems to show crenellations on turrets but not on the wall itself. 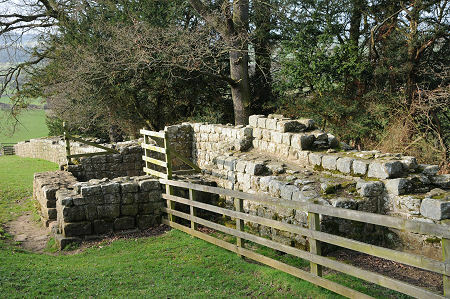 Beyond the upper end of the surviving wall section is a gate which gives access to a path running down the rear or northern side of the wall. The wall on this side is not so well preserved or restored, but in places the lower ground level means that it rises to a greater height.